A Star is Born, a new movie remake by Director Bradley Cooper, left me with some concerning thoughts. The movie is great, but also is one of the biggest failures. Why does it fail? This movie digs back into the sad and unfortunate reality of mental health and suicide. (Spoiler Alert) Why would anyone “in their right mind” commit suicide? When you look at the onslaught of celebrity suicides, over doses and early deaths, it cuts like a razor. When these celebrities seemingly had it all, they needed more from life than life could ever give them. The pain of living was too much that they committed suicide or medicated themselves to a point where their lives were ended in an overdose. This is serious! This Movie Fails and Fails BIG! Suicide is Not Entertainment! The bottom line is that suicide, in this movie, was made entertainment. This was not a love story. This was a story of a man that needed real help, but fell through the cracks despite being in AA and going through rehab. In the movie, Jackson Maine, the movie’s main character, alludes to committing suicide through his humored remembrance of his suicide attempt as a 13 year old boy. This is where the “social worker” in the rehab community missed the cue. I personally have lost 4 friends to suicide or an overdose. Watching this movie, I couldn’t help thinking of them. They were all so bright and full of life and truly loved people, but decided that they weren’t enough or the pain was too much. In the end, they decided that ending their lives could somehow solve their problem and was a real solution for them. However, their suicide, like this movie, only created more heartache. That’s where I find this movie leaving me. I can’t bring my friends back, but we can prevent senseless suicides when the opportunity presents itself. 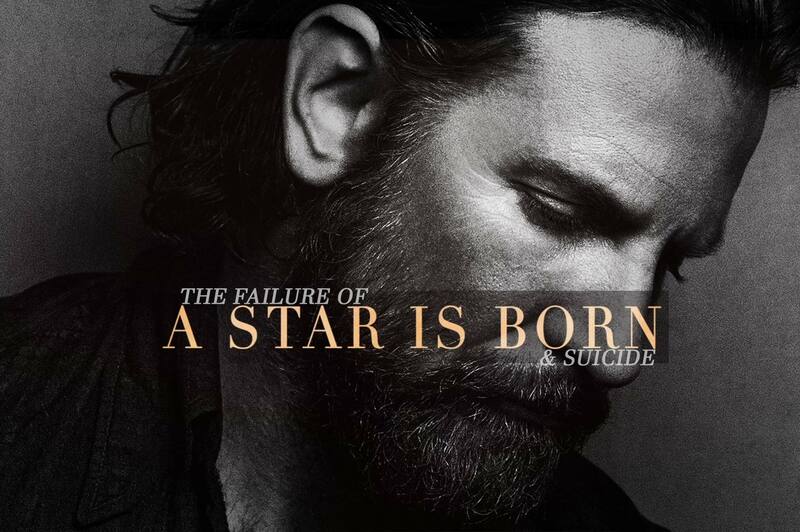 “A Star is Born” failed to stop another suicide. This movie had a present day obligation that went unmet. This was a great opportunity to talk to people that had been contemplating suicide. It failed to direct people to someone that would be willing to listen to them. It failed to make a difference in the world. It failed to stop another suicide! If you are struggling or have struggled with alcohol, drugs or have thought of suicide, please be aware. This movie is riddled with scenes of drunkenness and drugs. 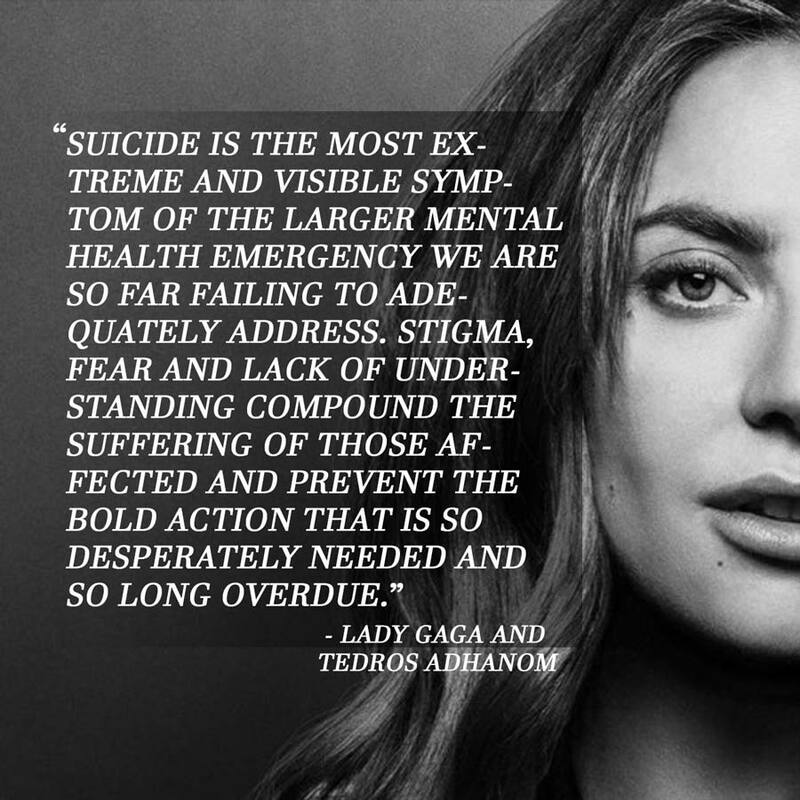 In the midst of what could have been a a clear miss on the part of all involved in the movie “A Star is Born”, Lady Gaga and Tedros Adhanom wrote a letter on the very subject of suicide. They cite the fact that nearly 800,000 people around the globe commit suicide every single year! The article entitled “800,000 people kill themselves every year. What can we do?” addresses many of these issues in an ever stressful world. “In too many places mental health support services are non-existent and those with treatable conditions are criminalized. Bold action is long overdue”. You can read more, here. There are people that loved Jackson Maine in the movie, and there is always someone that is hurt more by act of suicide than the issues and problems facing us in life and those facing a mental health issue. Think about that. Suicide breaks love down and will never have a chance to give. Suicide only takes. In this movie, Jackson Maine had much more love to give and by committing suicide took everything away from the people that loved him. If you are thinking about suicide or simply need to talk to someone, please call the suicide prevention hotline. Know that there are people that would be devastated by you even thinking of this! Collaborating with Cooper behind the scenes are Oscar-nominated director of photography Matthew Libatique (“Black Swan”), production designer Karen Murphy, three-time Oscar-nominated editor Jay Cassidy (“American Hustle,” “Silver Linings Playbook,” “Into the Wild”), and costume designer Erin Benach. A Star is Born was real. I’m going to counter what was said in this blog. I think the most important thing is: “A Star is Born” was NOT written for you, it was written for a larger, general population. It is clear that the movie resonated with a large number of people—people who, undoubtedly, have had experiences with tragedies portrayed in the film. It’s a movie—a remake of three previous movies that have the same tragic ending. The movie was not supposed to be about the prevention of suicide; the directors were following a storyline that had been crafted for decades. Hollywood, in no way, had an obligation to prevent suicide—Jack’s suicide is built into the narrative and this narrative is based on reality. Jack’s life’s story is tragic and his life mirrors many who struggle with the same issues depicted in the movie. This is reality. I believe the movie does shed light on people who fall through the cracks, as Jack did. The movie does—in my opinion—address suicide in a real way—it was tragic, there was substance abuse, great struggle, a prior attempt at suicide, and there was deep mourning. Throughout this film he suffered like many people do, and too often, their needs are not met. Again, reality. That humor was included when Jack attempted suicide at the age of thirteen was his prerogative. People do laugh at attempts they’ve made; this is their right. It’s their experience; no one owns them and it’s theirs to express. The use of alcohol and drugs is, again, depicting reality—I’m not sure why there needs to be a warning that the movie is “riddled with scenes of drunkenness and drug use.” Is it your assumption that people can’t handle viewing drugs and alcohol? Why? Again, this is reality. I think it’s important that we recognize that there are many ways to address love, mental illness, and suicide. I believe this film is authentic and did an excellent job depicting what happens to people who are struggling with substance abuse, depression, and who tragically end their lives. Hollywood did not fail. It did the opposite—It made it all real. Seeing this movie from the filter of “mental health awareness” and “suicide prevention”, yes this movie failed in moving the needle to save lives. Did the director of A Star is Born have an obligation to do so, no. I agree with you. Would it have been beneficial for audiences watching the movie to have a warning or a call to action to assist those dealing with with drugs or suicide, yes! What would a call to action look like? Or a warning? If you were to assist them in a call the action, what would you have them (producers) do? Thank you, Megan. I second that 1000%. I wholeheartedly agree with Megan. Thank you for your subjective views regarding the movie, Megan et al. Today we buried a son, grandson, nephew and loving friend to many, with a note that was left for us to watch the movie “a star is born” , then we will understand why he committed suicide in the garage. Then I checked up on reviews and found some very shallow views regarding “reality” and praise Holltwood, we’re living the grief of whatever the movie triggered in him that lead to a very real tragedy at this moment. This movie will not be watched by our family. With much sadness – William. I am so sorry for your loss. I found my father after he committed suicide and I have never been the same. Thank you for your comment, though I know it was not easy to write. It angers me that this production influenced your family member’s decisions and did not include a call-to-action in the film. Unfortunately, I fear that you are not the only family influenced by this negative film. Thank you for your comment. I understand how hard it is to lose a loved one to suicide! I’ve lost two people in my life to this and it always stings! We may have bad days, but it’s important to keep focus on how beautiful and precious life is!